Blueberries and ice cream—two things that remind me of childhood summers. I spent several years of my childhood living on the west side of Michigan where the blueberry patches are plentiful. Picking blueberries was a yearly event I looked forward to, but I think my brother, who ate more blueberries than actually went home, looked forward to it even more than I did. The same can be said for ice cream. I greatly enjoy ice cream, but my crazy red-headed brother simply adores ice cream! Isn’t it funny how certain flavors can bring back memories? 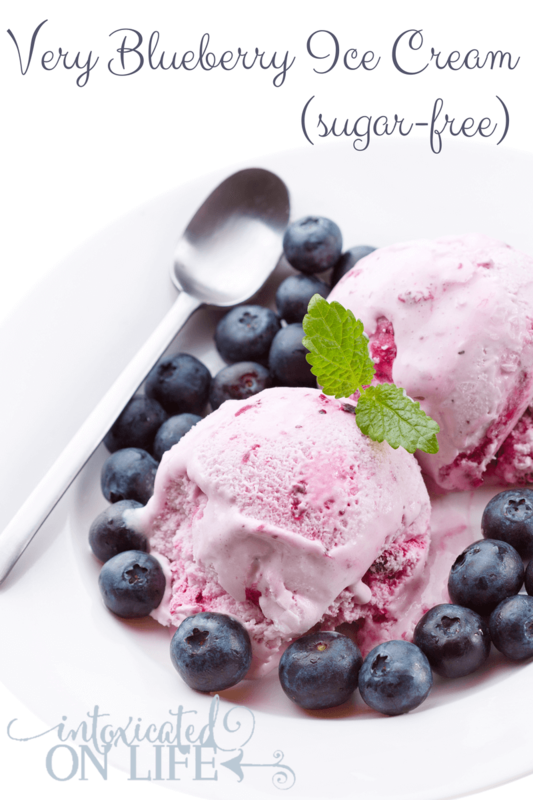 So, with a happy nostalgic smile on my face and memories of blueberry picking with my brother, I created this rich, creamy, sugar-free blueberry ice cream. What are some of the flavors that remind you of summer? Powder your xylitol if you have granulated xylitol (I run mine through the magic bullet, but a food processor or coffee grinder would do the job too). If using frozen blueberries, place them in a colander and run warm water over them until they are mostly thawed. Beat the eggs, xylitol, and stevia together until well combined. 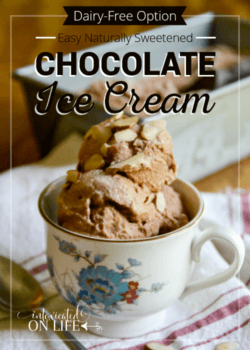 Pour cream mixture into an ice cream maker and run according to manufacturers suggestions. It took about 45 minutes for my ice cream to set up in my ice cream maker. 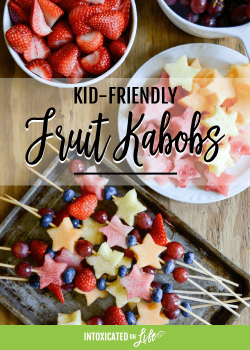 Looking for other healthy, sweet, summer treats? 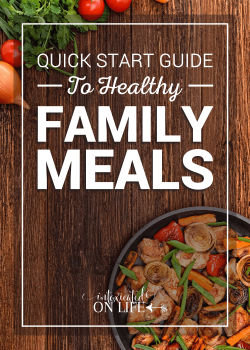 If you’re looking for more tasty treats to end the summer with, why not try some of these healthy-alternatives to treats we all know and love?! You can also follow my sugar-free desserts board on Pinterest! Follow Trisha Gilkerson’s board Desserts made with xylitol, stevia, and/or erythritol on Pinterest. Your Ice cream looks great and I love your wholefood approach. I am hosting Foodie Fridays @ Puregracefarms right now and it would be great if you would come by and share. I absolutely love blueberries! Thanks for sharing at the #WWDParty. Your Blueberry Ice Cream has a beautiful color and looks delicious! Thank you so much for sharing this awesome post with Full Plate Thursday and hope you are having a fantastic weekend! Delicious blueberry ice cream love this sugar free version. Thanks for sharing with Hearth and soul blog hop. pinning.